The working principle of the box shape fluidizing drying machine is that clean, hot air enters the fluidization bed through a valve plate. 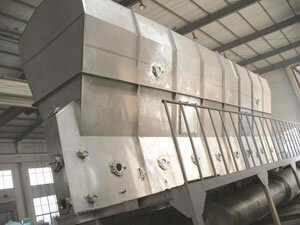 The wet material fed from the feeder is met with hot air over a large area of contact, so the drying time is very fast. It is thus popular for use with products from many industries. The box shape fluidizing drying machine is also called a fluidization bed. Through continuous improvement over 30 years, it has become popular for use in the fields of pharmaceuticals, chemicals, foodstuff, processing of grain, and more. For example, the dehumidification and drying of powder and granular materials include bulk pharmaceuticals, granular patent medicines, preparations, feed, plastic resin etc. The granular diameter created by the box shape fluidizing drying machine is from 0.1 to 6mm. The fluidizing bed, cyclone separator, and cloth bag dust remover should be placed on flat, concrete ground, and no foundation screw is required. The fan with underframe and foundation screws can be installed indoors or outdoors. The layout can be adjusted slightly in accordance with the practical conditions. The final pipe system assembly of the box shape fluidizing drying machine should be airtight. Steam, electricity, or fuel (or coal) can be used to heat the box shape fluidizing drying machine. The drying ability of the box shape fluidizing drying machine is measured on the basis of the beginning and ending moisture contents of 20% and 5%, respectively, of drying plum crystal and air intake temperature of 130℃. The drying ability of other materials would be based on the existing drying conditions. "Heating energy consumption": Steam or electric power may be used independently. Xianfeng Drying is a Chinese manufacturer of a high quality box shape fluidizing drying machine. In addition, we offer a flash evaporation drying machine, chicken seasoning granulating drying machine, square vibrate sieve, and more.